18 November 2010, at 9:38a.m. NORTHERN IRELAND, UK - Moy Park has opened a new turkey processing facility at its Ballymena processing plant, representing an investment of £21 million in the business. The new factory was officially opened by Enterprise Minister, Arlene Foster, at an event attended by government, agri-food and retail representatives. The £21 million world class facility is part of a phased four year £37 million investment project, supported by Invest Northern Ireland and the European Regional Development Fund, which was announced earlier this year. The investment has resulted in a 65,000-square foot factory extension, which will allow the company to produce one million fresh turkeys for the Christmas period. The expansion will secure 150 permanent and 500 seasonal jobs at Moy Park Ballymena, and will also provide secondary employment opportunities for turkey growers to supply the increased capacity. 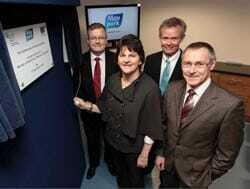 Pictured at the official opening of the new Moy Park turkey processing facility are (left to right) Moy Park Ballymena Executive Director Tony O’Neill, Enterprise Minister Arlene Foster, Moy Park Chief Executive Nigel Dunlop and Henry Elvin, Ulster Bank Head of Business Banking, Northern Ireland. Commenting on the new facilities, Moy Park Ballymena Executive Director Tony O'Neill said: "This investment represents a major leap forward in our capability and capacity as a turkey supplier, and today we recognise the vital role that Invest NI and Ulster Bank have played in making our plans a reality. Our business has been achieving significant growth year on year, and this expansion is a reflection of our confidence moving forward. These facilities will allow us to produce and process fresh turkeys during an intensive seasonal window, comfortably meeting consumer demand locally and throughout the UK and Ireland." Moy Park Chief Executive, Nigel Dunlop, added: "This expansion forms part of a wider investment programme across Moy Park factories and poultry farms which will give us the flexibility to grow our business and meet the future demands of the marketplace. Notably, the agri-food sector is one of the only industries in Northern Ireland that has continued to thrive in recent times, and we believe that this joint investment is an excellent example of government and private industry working together to exploit growth opportunities for the industry and for Northern Ireland." Henry Elvin, Ulster Bank Head of Business Banking, Northern Ireland, said: "We are delighted to be so closely involved in the continuing growth and expansion of what is a highly innovative and successful agri-food company. The agri-food industry continues to be a vital driver in the local economy, securing exports, investing for growth, and creating employment. Ulster Bank remains strongly committed to leading the way in supporting innovative agri-food companies." Moy Park Ballymena supplies major food retailers including Marks & Spencer, Tesco, The Co-Operative and Dunnes Stores. A large percentage of the turkeys supplied by the new factory will be sold through Marks & Spencer stores.